Lagan Valley MLA Paul Givan has voiced his support of the Fire and Rescue Service following a meeting at Stormont with the Fire Brigade Union. Mr Givan, together with fellow Lagan Valley MLA Jonathan Craig, met with union representatives to discuss the ongoing financial pressures being faced by the Fire Brigade, which has its headquarters in Lisburn. Speaking following the meeting, Mr Givan said: “The financial pressures facing our Fire Service is real and elected representatives need to listen to the concerns that are being raised. “I met with representatives of the Fire Brigades Union at Stormont and valid issues are being raised that during the consultation period for the budget for next year will need to be given careful consideration before a final budget is reached. “The men and women of the Fire Service provide a vital front line service and put their own lives on the line to save the lives of people in danger. 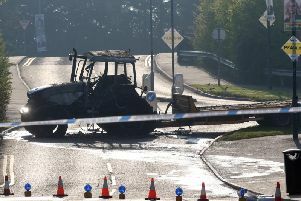 The Fire Service responds not just to fires but to serious traffic accidents and farm incidents that can lead to tragic deaths. Raising awareness of public safety and preventing fires and accidents happening is an important role for the Fire Service which is facing pressure to cut back because of the financial pressures it is facing.